The illustrators of the Alice books have, over the years, been many and varied. These two web sites have been created to show as many of these as possible. The focus is on British editions but some notable other English Language editions are included, for a flavour of international illustrated editions, a new book - 'Illustrating Alice' published by Artist's Choice in 2013 should be consulted. (There is an error on page 25 of this book, where a Charles Robinson illustration is attributed to his brother Thomas Heath Robinson but overall it is a wonderful book). This site covers the period from 1899 to 1929 and the companion site at; https://sites.google.com/site/lewiscarrollalice19292010/ covers the period from 1930 to 2018. The books shown on these two sites are a selection based on the lists given in 'The Book and Magazine Collector' Journal Feb 2009 No. 304 and Williams et al 'The Lewis Carroll Handbook' revised 1979 edition. This project is an attempt to show all the major illustrators of the Alice books from 1899 to 2012. In the main British editions are shown but where there are other publications of note these are also included. Up to 1907 Macmillan held the exclusive copyright of 'Alice's Adventures' in Britain and the Colonies. ('Through the Looking-Glass' copyright did not run out until 1948). When the copyright ran out many publishers took the opportunity to issue the Alice book with new illustrations and around 20 editions appeared in the following two years alone. The first artist to produce new illustrations for 'Alice' was Beatrix Potter in the 1890s, she created 6 illustrations but none appeared in book form. Harry Furniss produced some black & white illustrations, published in Arthur Mee's The Children's Encyclopedia during 1908/1909. They also never appeared in book form. In America, until 1891, publishers could reprint British books without the copyright restraint but from that date they had to get the agreement of the UK publishers and authors. 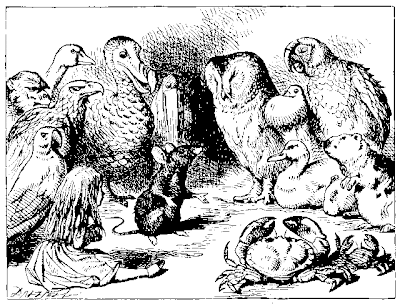 As a result several US publishing houses issued copies of the Alice books with Tenniel illustrations. McManus was the first to attempt the task of providing new illustrations for the books in 1896 &1899 with, it could be argued, mixed results.